Cost: Varies, depending on materials selected. Approximately $8-10 as shown. These are very pretty opalite earrings. Opalite is a man-made stone that looks a lot like moonstone and opal as it has the same reflective blue-pink translucent quality. Moonstone is the birthstone for June, so this is a good project to make for a birthday gift. The glowing stone is quite lovely. Here I made some "raindrop" cascades using opalite beads and chain. Actually, this design works well with any longish shaped bead, so try it with other colors as well. Of course, you can use gold chain, but in this design I went with sterling silver, and attached them to french hook ear wires. Lovely and timeless, this design works great with any large/small bead combination, so use whatever bead combo you have on hand! You can also vary the design by attaching small beads or crystals to the bottom of the chain. Cut four short, four medium, and four longer lengths of chain. Two of each length will go on either earring. I cut mine about about .5 inch. .75 inch, and 1 inch, but decide how far down you want your earrings to hang and decide how long to cut your chain. TIP - I use this trick to cut all my chain the same length. Slide the chain onto a piece of wire or headpin and let it hang. Cut to desired length, and repeat, lining the next length of chain up next to the first one. For each earring , we will attach a short, medium, and long chain, and then a bead, and then the reverse (long, medium, short) chain to the bottom of each bead. This makes all the chains the same length when we are done. 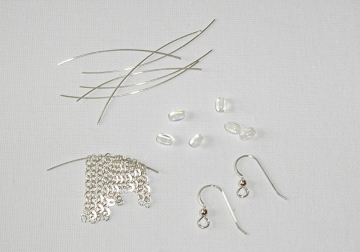 Attach the beads to chain and earring component. 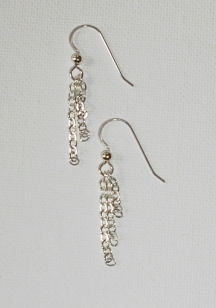 Separate the loop on the earring component using pliers, and slide on the three chains in the same order on each earring (short, medium, long). Next we will attach the beads and lower part of the chains. Cut several inches of sterling silver wire. Make a wire loop, attaching the chain to the loop, then closing it. Slide an opalite bead onto the wire, then make a closing loop on the other side, attaching it to the chain. If you need help learning to make a loop, follow these instructions. You can also follow my instructions on making beaded chain to get help on how to do this technique. Note the pattern--short chain, bead, long chain. Medium chain, bead, medium chain, and finally long chain, bead, and short chain. 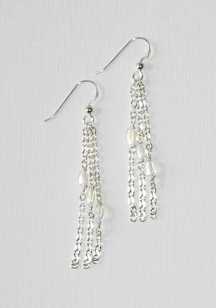 Your earrings should have chains of the same length, but you can always cut chain on the bottom to get the desired look. That's it, your swingy new chain earrings are ready to wear!